The Rev. Clark D. Carr, who served as a chaplain for his Maryland Army National Guard Unit, returned from Baghdad on March 31 after deploying in June 2007. He returned to his appointment as pastor at Grace United Methodist Church, Hagerstown, Md., on April 20. United Methodist News Service sent three questions and asked him to reflect on the five years since the start of the Iraq war. He answered the questions en route home with his soldier congregation. Q. What was your initial reaction to the U.S. going to war with Iraq, and has it changed over the past five years? Rev. Clark D. Carr Regarding going to war with Iraq, I was in Hohenfehls, Germany, on a two-week Overseas Training Deployment mission from the Maryland Army National Guard to the Combined Maneuver Training Unit Ministry Team. The first week there was one week before the beginning of Operation Iraqi Freedom. The prevailing attitude among believers, as well as the rank and file, was no one wanted to go to war. The day following the war's start, the chaplain teams gathered for religious support training. The chaplain leading in prayer said: "Today is a sad, sad day; for last night hundreds and hundreds perished into eternity without the knowledge of the Savior Jesus Christ." From a chaplain's perspective, no matter what position we had regarding the onset of the war, our overriding concern was for souls — souls of our warriors, the souls of the innocent and opposition forces who perished. Throughout my time there, we were getting reports from chaplains in OEF (Afghanistan) and in the staging areas in Kuwait of scores and scores of soldiers receiving Christ as their Savior, being immersed in baptismal waters, and recommitting their lives as Christians. From a chaplain's perspective, no matter what position we had regarding the onset of the war, our overriding concern was for souls — souls of our warriors, the souls of the innocent and opposition forces who perished. And, today, that concern still stands for the chaplain in the theater of operation. Rev. 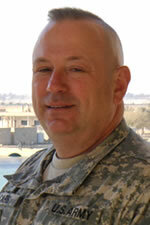 Clark D. Carr led hundreds of religious activities during his nine months in Iraq. Personally, I knew that we were not going to war due to weapons of mass destruction, for oil, or to settle an outstanding grudge. I knew that in the war against global terrorism, the old ways of dealing with national security were off the table and patience with the international community (including the United Nations) was short. For 15 years, the U.N. was unable to enforce its resolutions on Iraq, and Sadaam Hussein's evil continued to devastate the Iraqi people. Although I might not agree that Iraq was a present threat, I could understand President George W. Bush's dilemma with the U.N. and the defiant dictator and how it presented an uncertain security risk for our nation. Did this necessitate going to war? I personally didn't believe so, but at the same time I did not have the weight of a nation's security on my shoulders and I had to trust whatever the decision, whether I agreed with it or not. Either way, my mission wouldn't change — the care, maintenance and salvation of the soul of the warrior. Q. What role (if any) do you think The United Methodist Church should take on issues of war? I believe the leadership and voices of United Methodism should disassociate and disengage from populace bias, whether social progressive or traditional. As believers and as a church, our prophetic voices are muddied if we get sucked up into the agendas the radical left or the reactionary right polar stances. Thus, our perspective becomes distorted by socio-political causes, the prevailing winds of discontent or the waves of patriotic fervor. Mixed messages become prevalent, divided loyalties become the norm, and disdain for those who hold a different view become commonplace. A Blackhawk helicopter lands to extract soldiers near Tall Afar, Iraq. The scriptural adage to "reason together" is lost in the storm of shouting voices all claiming the moral high ground — and where does that leave us? I contend that such posturing only weakens our voice as a church because we become typified rather than heard. Should United Methodists advocate for peace at all costs? Yes. Should United Methodists take stands on atrocities and violations against the Laws of War and Geneva Conventions? Yes. Should United Methodists be able to express opinions on the conduct and execution of war? Yes. I often discussed how the aftermath of the war was a series of miscalculations and mis-estimations that led to an escalation of sect insurgency. If a people and a nation are given liberty, yet have no concept of freedom, how else are they to behave? Cultural stances based on political worldviews are something the church should be able to influence redemptively to the glory of God and exaltation of Jesus Christ, rather than allow cultural attitudes to define and dictate to the church. An example of this is when I would hear the oft-said statement, "We support the troops, not the war." Where did that come from? Guilt from how veterans were treated as they returned from Vietnam? An appearance of seeming unpatriotic if we don't support our warriors? Or, a convenient excuse to remain ignorantly straddled on a fence of non-commitment? Soldiers saw through such ambiguous statements and certainly didn't "feel the love." What the non-warrior fails to understand is there is a direct correlation between the home-front and the meaningfulness of their mission. A soldier with the North Carolina Army National Guard returns home in 2004 after a 15-month deployment in Iraq. The soldier is a straight shooter and transparent to the core. He or she has no hesitation telling it like it is — often interspersed with coarse vulgarity. This profane honesty knows no pretense, and I can't help but see Jesus being drawn to them for their unabashed wit and frank sincerity. And, the soldier knows doublespeak when he or she hears it. So as a church, we need to send a balanced, consistent message understanding their plight and their dilemma, and encourage them to maintain purpose in war where there may not always be clear answers. There are three ways the church, whether locally or as a denomination, can be a redemptive force amidst war. Clarify the message. This is the first step. We should demonstrate that war is evil and undesirable in all situations; however, history proves the inevitability of war, as well as other social evils. As a chaplain, I don't advocate war or killing. However, every day I encounter those who are engaged in war and/or killing. My ministering to their plight doesn't mean I'm for or against war. However, I am there for the soldier. I am able to differentiate between how I might feel from what the soul of the soldier requires. Tell the story. Every week in the 10 chapels across the Victory Base Complex (VBC) over which I had purview, hundreds of religious activities occurred. Roman Catholic, Eastern Orthodox, Assyrian Catholic, Protestant of all varieties, Jewish, Seventh Day Adventist, Islamic, Latter Day Saint, and yes, even Wiccan were able to celebrate their constitutional right of religious free expression. Scores of Bible studies, catechisms and seminars were ongoing within the chapels and the units themselves. We had Brits, Australians, Tongans, Ugandans, Canadians, Koreans, Iraqis, Pakistanis, Filipino and more all joining in praise in our houses of worship. Put aside pompous and vain oratory, and do what we do best: proclaim and live out the Good News of Jesus Christ — yes, even in the context of war. I myself sponsored a Jewish lay leader and congregation, sponsored the Seventh Day Adventist lay leader and congregation, participated/led/preached at protestant services across the VBC, conducted two weekly Bible studies and led two praise and worship experiences with the Ugandan security force at their place of work at the Entry Control Point (ECP). Between Friday and Sunday, I was engaged in a minimum of four and upward to eight worship experiences. Tell the story. Tell the story of lives turned over to Jesus. The greatest blessing of my last Sunday in Iraq was witnessing three baptisms (a male soldier, a female soldier and a female Iraqi interpreter) — this is the story not being told to the churches. Tell the story of chaplains interfacing with local sheiks and Imams. Tell the story of shoes, clothes, coats (yes, I witnessed snow in Baghdad), school supplies and health and hygiene items collected by churches and sent to chaplains to distribute through Iraqi assistance groups. Tell the story of how the generosity of United Methodists across the United States put 200 minute phone cards in the hands of troops needing to keep connected to home. The United Methodist Endorsing Agency sent me 1,000-plus cards. Every week, either I or my assistant was asked if we had cards available, and I am proud to say I always had a card to give them. Yes, even in war there is a Good News story to be told. Soldiers with the 447th Air Expeditionary Group, stationed in Baghdad, offer thanks for phone cards provided by the United Methodist Church. Reach out. We must find ways to reach out to soldiers on the bases and the communities in which they live. The United States is going to feel the effects of the global war on terrorism for generations to come. Post-traumatic stress disorder/mild brain traumatic injury, the physically disabled, and the families broken due to lengthy and repeated separations will be the new mission fields of the church. What are we doing now to open our hearts, our minds and our doors to the veteran, and what will we be doing in the future? A clear balanced message free of doublespeak and biased agenda, a telling of the story not told, and a reaching out to the veteran are redemptive means the church can engage on the issues of war. Put aside pompous and vain oratory, and do what we do best: proclaim and live out the Good News of Jesus Christ — yes, even in the context of war. Q. Have you been happy or disappointed with some of the views issued by church leadership that have been critical of President Bush and the war? Personally, I feel largely dissatisfied with the stances the church leadership has taken on the war — even to the point of embarrassment. The "anti-war" rhetoric appears more of a regurgitated cause to rally around for those who want to recapture the sentiment of the '60s and '70s. The unwillingness to evaluate critically all dimensions of our nation's plight against the real and/or perceived threat of global terrorism is woeful. For as such, they become guilty of the same entropic narrow-minded perspective they accuse of the executive office. Rather than finding ways to build redemptive bridges that would not only make a difference in the politic and actually affect our cultural understanding of how a believer struggles with evils of war and terror and reconciles them with their faith, they instead wage attacks and identify themselves with the "hate Bush" and "anyone but Bush" pundits. So then, are they any better than the Limbaughs, Roves and Hannitys whom they criticize? I would therefore suggest that before church officials take dogmatic stances, they first differentiate between their cultural socio-political bias and preconceived presuppositions; second, seek the experience and wisdom from others on all sides and not just the counsel of those who agree with them; and, third, through Scripture, prayer and conferencing together, find ways on how the church can be a redemptive voice in the wake of war. Article copyright © 2008, United Methodist News Service. Used by permission and courtesy of United Methodist News Service.